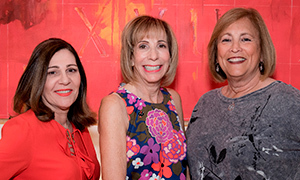 The Jewish Women’s Foundation (JWF) of South Palm Beach County hosted its 2018 Granting Wishes Cocktail Reception on March 14 at Boca Rio Golf Club. More than160 guests from across the Jewish community were the first to learn about JWF’s $105,000 2018 grant awards (see list below) to organizations in the local community and in Israel. They also enjoyed hearing from award-winning Jewish journalists Denise Albert and Melissa Musen Gerstein, who co-founded The MOMS multi-platform lifestyle brand. The MOMS is featured on TV, radio, podcasts and online, in print and taxicabs, and at Mamarazzi® town hall events with celebrities. 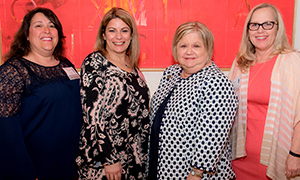 Co-chaired by Amy Rosenberg and Randee Rubenstein, the evening also included an abundant array of hors d’oeuvres, food stations, desserts and wine amid an elegant yet informal atmosphere. "These dollars are donations from the JWF Trustees who contribute a minimum of $2,000 per year for five years, and determine the programs to fund,” added JWF Chair Alice Kemper. “Each of us has a choice of where to put our time, resources and money. In this critical time for women and children, JWF, with our hands-on philanthropy grant process, advances the lives and opportunities of Jewish women and children locally and abroad. We are highly rewarded and proudly wear the badge of agents of change." The Jacobson Jewish Community Foundation is generously sponsored by Greenspoon Marder. The 2018 JWF Granting Wishes Reception was generously sponsored by Boca Raton Regional Hospital Foundation and Brown's Interior Design. The Boca Raton Observer was Exclusive Magazine Sponsor and In-Kind Sponsor was Southern Glazer’s Wine & Spirits.